The real "Big Kahuna," Duke Kahanamoku, is today best remembered for his surfing prowess, but we often forget that he was also a five-time U.S. Olympic swimming champion from 1912-1932 and played for the U.S. water polo team at the 1932 Summer Olympics. 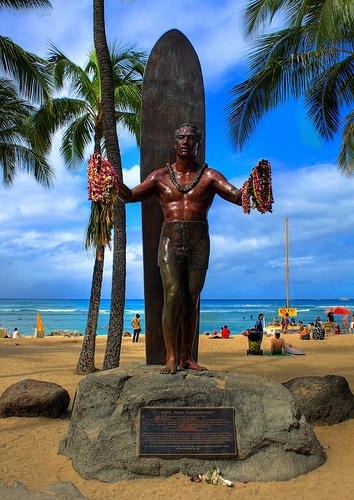 These facts were discovered when the PaddleAir team stumbled across the 1957 "This Is Your Life" video with Ralph Edwards about "Duke Kahanamoku Olympic Hero/Sheriff/'Father of Surfing'." Sure you can read all about the Duke's life on **Wikipedia. However, the 24 minutes of the black-and-white video, below, are a nostalgic and often amusing foray into the last century and a wonderful source of material for trivia buffs.